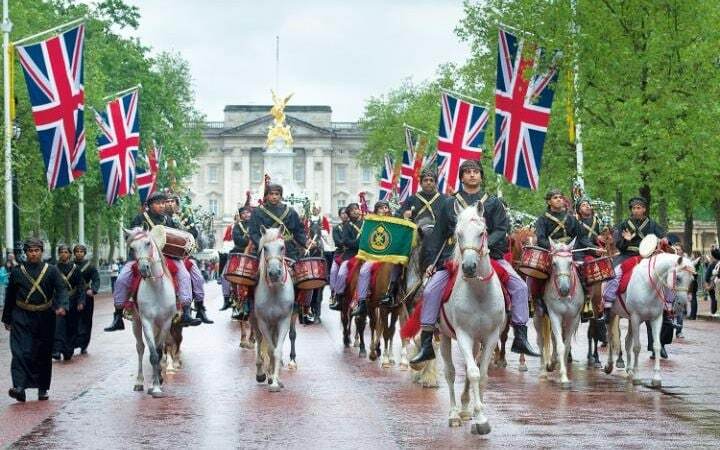 THE Royal Cavalry of Oman's troupe of 100 horses and 150 performers will be among the top attractions at the Royal Windsor Horse Show which is also part of Her Majesty the Queen's 90th birthday celebrations. 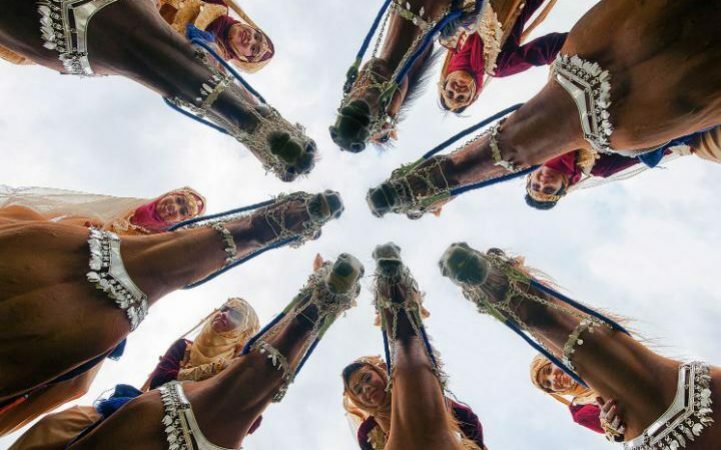 The renowned Omani cavalry unit will be among the 900 horses and 1,500 participants at the show and the event’s organiser, Simon Brooks-Ward, told The Daily Telegraph: "The Omanis performed in front of the Queen on a state visit there in 2010 and were extremely well received. "As a result, we invited them to England for the Diamond Jubilee Pageant in 2012. They went down so well that they will be one of our star acts at Windsor. They provide a performance the like of which British audiences rarely see." During the last 10 months, Omani cavalry officers have been preparing to perform in pastoral Great Britain, in distinct contrast to their own parade ground where temperatures in the Sultanate often hit 50C during the summer and rainfall is treated like a gift from heaven. Part of the cavalry’s base next to Al Safinat beach has been somewhat anglicised in recent months to mirror Windsor Park showground, over 3,500 miles away. The replica royal grandstand faces the Indian Ocean. There's no grass the only vegetation is palm trees. Their horses include Arabs, Clydesdales and Shires. Mr Brooks-Ward said: "The countries and acts for Windsor have been selected for their variety and ability to join in with the spirit of the event. Most of the cavalry ride barefoot. We will be praying for good weather." The Queen will be present at the finale and before that a member of the Royal family will attend each of the show's four evening programme and with the Omanis are Chilean huasos, who will perform a synchronised dance routine; Canadian Mounted Police showing off their horsemanship, a troupe of dancers from Azerbaijan, and acrobatic riders on Karabakh mountain horses. Brigadier-General Abdulrazak al Sharwazi, of the Royal Cavalry team, is in charge of 100 horses and a cast of 150 male and female riders and musicians. The horses are transported in two specially modified Boeing 777 jets before they set up camp in Windsor Park for three weeks. The Omanis were booked to arrive in England in April so the team could acclimatise. The Brigadier said: "We can recreate the Windsor showground for our riders but we cannot teach the horses what to expect. "In Oman they are not used to performing with the noises of a large crowd sitting so close - their role is ceremonial and takes place on large display grounds for royalty and state visits. "Just the murmur of talking or the clatter of a seat nearby can be disturbing. There is also the very real worry of cold weather. It is totally alien to the Arab horse. Stunts include a 10-man pyramid on horseback, and a thunderous cavalry charge." The cavalry unit was established by His Majesty Sultan Qaboos in 1974, initially with just 20 horses. Later a ceremonial section was created to celebrate the riding skills of the Sultan's countrymen and women. 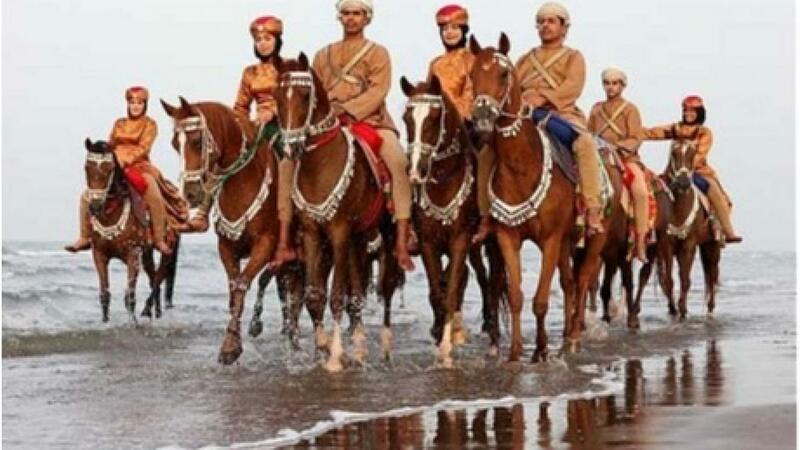 Horses have played a great part in Oman's history and remain highly prized in society, for both showing and racing.